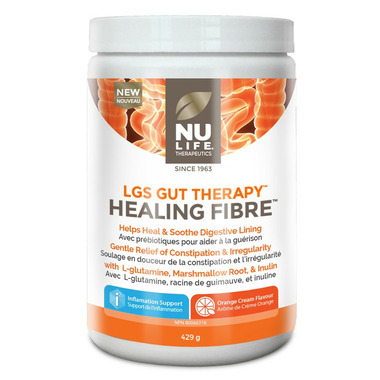 Nu Life Therapeutics LGS Gut Therapy Healing Fibre is a multi-action formula created by a Naturopathic Doctor and ideal for anyone suffering from bowel irregularities or looking to heal symptoms of a leaky gut. This great tasting powder contains a comprehensive blend of prebiotic fibres to support the diverse population of friendly bacteria in your gut and therapeutic doses of supportive ingredients like L-glutamine, marshmallow root and psyllium. Each scoop of this powerful formula contains clinically proven ingredients and prebiotics to support and maintain a healthy digestive system. 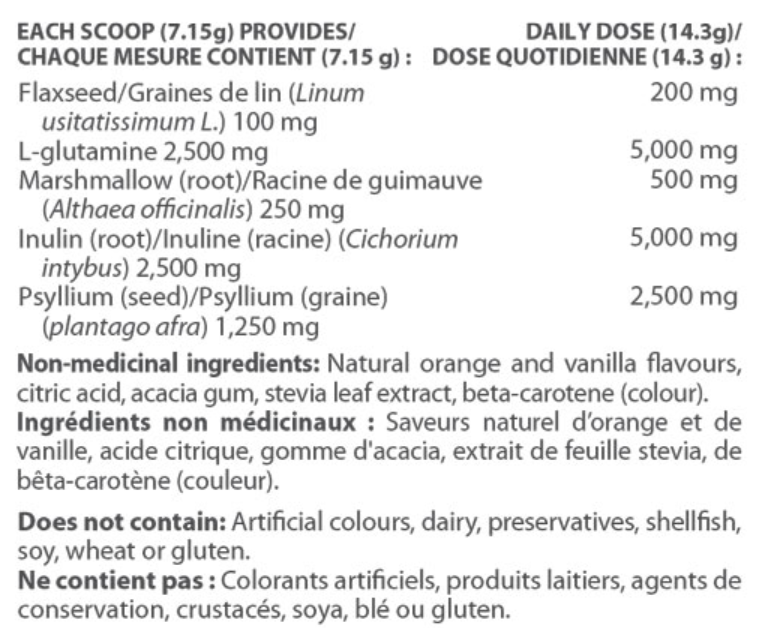 Directions: Adults, mix 2 scoops (3 teaspoons) daily with 250 mL of cold liquid (water, fruit juice or similar aqueous beverage). Stir briskly and drink immediately. Maintain adequate liq¬uid intake. Take 2 hours before or after taking other medications or natural health products. Caution: Effects observed 12-24 hours after first dose, and may take 2-3 days. Consult a health care practitioner if symptoms worsen or if laxative effect does not occur within seven days. Consult a health care practitioner immediately if you experience chest pain, vomiting, or difficulty in swallowing or breathing after taking this product. Consult a health care practitioner prior to use if you are pregnant or breastfeeding or following a low protein diet or taking medications which inhibit peristaltic movement (e.g. opioids, loperamide), have diabetes or have symptoms such as abdominal pain, nausea, vomiting or fever (as these could be signs of abnormal constrictions of the gastrointestinal tract, diseases of the oesophagus and/or the superior opening of the stomach (cardia), potential or existing intestinal blockage, paralysis of the intestine, megacolon, faecal impaction, infl¬amed bowel or appendicitis). Do not use if you are experiencing a sudden change in bowel habits that has persisted for more than 2 weeks, undiagnosed rectal bleeding, or failure to defecate following the use of another laxative product or have diabetes mellitus in which blood sugar is difficult to regulate or have difficulty swallowing. Keep out of reach of children.